EVERYWOMAN (Reproductive Care in the Safety-Net: Women’s Health Care after Affordable Care Act Implementation) is a reproductive health study currently underway at OCHIN. This grant-funded project is looking at differences in health care utilization and outcomes among women receiving care in community health centers (CHCs) before and after ACA implementation, and how it differs between Medicaid expansion and non-expansion states. In 2010, the Affordable Care Act (ACA) prioritized reproductive health care – contraceptive services, preventive care, and pregnancy care – as an essential component of women’s health care. This legislation also provided greater access to care through Medicaid expansion (1, 2). However, states have been given considerable latitude in how to implement the ACA, including whether to expand Medicaid, how to cover preventive services, and other state level policies that may impact access or coverage. This variability among states creates a natural experiment which EVERYWOMAN is using to examine policy impacts on women’s reproductive health care in CHC settings. While there have been previous studies on the impact of Medicaid expansion, few studies have examined the impacts on reproductive health care. EVERYWOMAN helps to fill this gap by using electronic health record (EHR) data from the ADVANCE Research Data Warehouse (RDW) to identify individual-, clinic-, and community-level factors (such as income, education, housing) influencing women’s reproductive care. We will contextualize our quantitative work with a series of patient, provider, clinic staff, and CHC leader interviews asking about individual experiences accessing and delivering care. 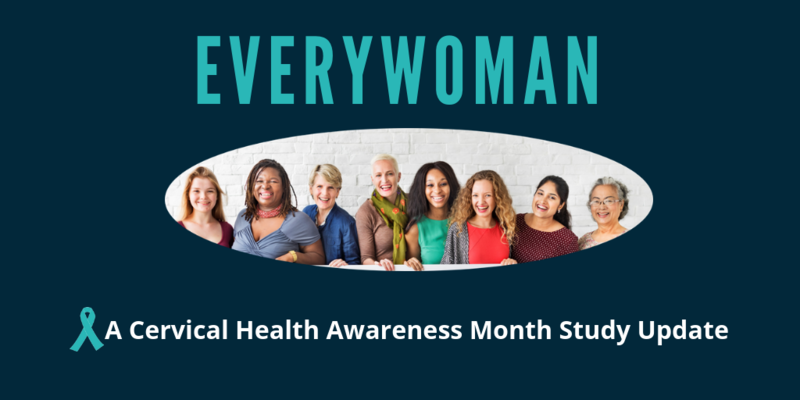 The month of January is Cervical Health Awareness month, so it is appropriate to highlight some preliminary findings from the EVERYWOMAN study. This first analysis looked at routine screening for cervical cancer, gonorrhea and chlamydia, HIV, and blood pressure as well as vaccination for HPV and flu among women and girls who were due for these services. Looking in the two years before (2012 and 2013) and two years after (2014 and 2015) ACA implementation, we wanted to see if women and girls were getting more care as recommended by national guidelines such as the Centers for Disease Control and US Preventive Services Task Force. We measured care for 426,957 patients from 10 Medicaid expansion states, and 356,693 patients from 4 non-expansion states. 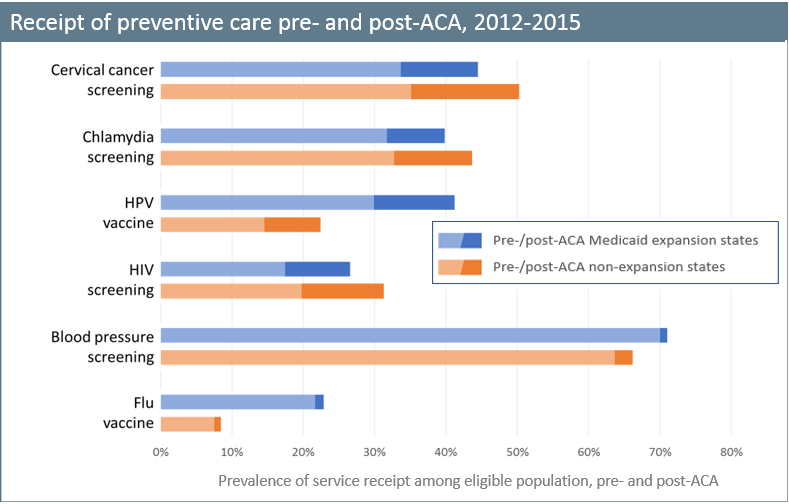 As expected, the initial findings showed that after the Medicaid expansion went into effect in 2014, delivery of preventive services increased for all services (screening and vaccinations) in Medicaid expansion and non-expansion states. For several services, there was greater improvement in service delivery among non-expansion states (compared to expansion states)—this was a surprising finding that we look forward to exploring in more depth! Some hypotheses include pent up demand for preventive care among newly established patients (more new patients in expansion states), specific state-level initiatives designed to improve service delivery, and changing demands or patterns of service use within CHCs and safety net settings. EVERYWOMAN is also in the process of recruiting 6 sites for patient and provider interviews. We aim to recruit a mix of organizations from Medicaid expansion and non-expansion states, urban and rural areas, some offering prenatal and obstetric care, and some using Title X to fund their family planning services. We will work with each site to arrange telephone interviews with 5-6 patients, 4-5 providers and care team members, and 1-2 organizational leaders such as Medical Directors or COOs to get a broad range of experience and perceptions. We will use these interviews to learn more about how reproductive/sexual health care is delivered in different CHCs, the types of care women receive and how it could be improved, and how local communities and providers have been impacted by federal and state policies influencing women’s reproductive health. If you are an OCHIN member organization interested in taking part or learning more about this portion of the study, please contact Anna Templeton (Project Director) at templetona@ochin.org or Jee Oakley (Project Manager) at oakleyj@ochin.org. Arora P, Desai K. Impact of Affordable Care Act coverage expansion on women’s reproductive preventive services in the United States. Preventive medicine. 2016;89:224-9. Wood S, Goetz-Goldberg D, Beeson T, Bruen B, Johnson K, Mead H, et al. Health centers and family planning: A nationwide survey. Washington, DC: George Washington University Department of Health Policy; 2013 March 7, 2013.